There are 3 types of news options available to broadcast to staff in the Staff Portal: Staff News, Department News, and My News. Staff & Department News are both created and managed from the Staff Portal menu. My News, or the Login Message, is managed from the individual staff member's record. All news broadcasts are displayed on the News tab in the Staff Portal. This is visible only if the staff member has the specific Department saved on their Staff record > Portal Settings tab in the Default Department or Additional Dept News fields. Point to Staff Portal in the main menu, drop down to Settings and select Department News from the pop-out menu. Click the pencil icon to the left of the Department to edit. Add/edit the news in the editor that opens. 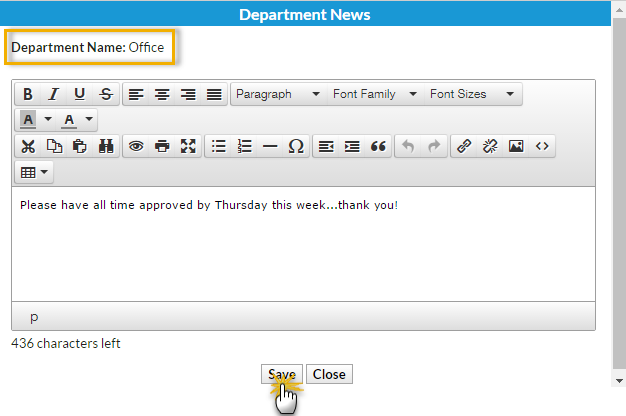 Note: The editor works much like the email editor allowing you to change fonts, colors, styles, etc. 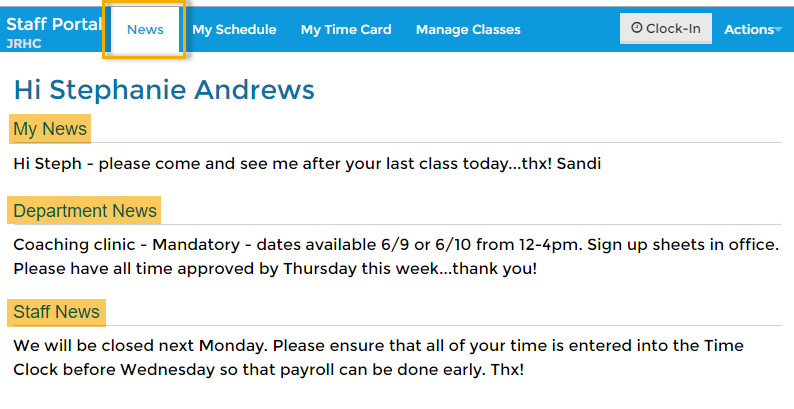 When the staff member in the department (or departments) logs into their portal, the saved news is visible on the News tab, under the Department News heading. Note: The news displays until deleted using the trash can icon or updated using the pencil icon. This news is visible to all staff members who access the Staff Portal. Point to Staff Portal in the main menu, drop down to Settings and select Staff News from the pop-out menu. In the Edit Staff News editor, add your announcement. Note: The editor works much like the email editor in Jackrabbit allowing you to change fonts, colors, styles, etc. When a staff member logs into their portal the saved news is visible on the News tab, under the Staff News heading. Note: The news displays until you either edit it to change the content or clear it by deleting the message in the editor. My News is specific to the staff person and can not be viewed by any other staff person. This message is entered in the individual staff person's record. Point to Staff in the menu bar and click List Active (or All) Staff. Click the staff member's Portal Settings tab. Enter a Login Message to display as My News. Optionally, enter a Login Message Expiration date (the message will no longer display on or after that date). Note: This does not automatically clear the Login Message field on that date. When the staff member logs in, the saved message is visible on the News tab, under the My News heading. Note: If no expiration date is entered the news will display until you clear the Login Message field.